No development did more to spread the popularity of mobile phones than the introduction of no-contract Pay as You Go deals. The main bar stopping people from signing up to mobile phone deals was a reluctance to commit to a contract. With that obstacle removed, mobile phones changed from a luxury to a necessity. Initial prices for the uninspiring PAYG handsets were high, but when the supermarkets joined in, the price of handsets tumbled. 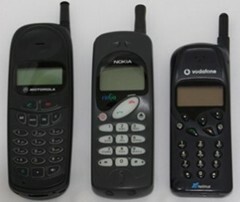 Vodafone offered the first non-contract mobile phone deal in 1996, but failed to realise the potential of PAYG. Vodafone Pre-paid was aimed at customers with poor credit history and made very little impression on the market. It took innovation from much less risk averse Mercury One2One to give pre-paid its proper place. Mercury, who launched One2One when it only covered London, was the first to offer a digital pre-paid service, Up2You, in October 1997. Up2You gave you a mobile phone in a box with no contract. It cost a whopping £179.99. Top-ups cost £20 and you needed to buy one every ninety days. Call charges were high at 50p per minute for any time of day. There was just one choice of handset, the Nortel m900, which became the UK's first GSM PAYG mobile phone. The 'm900' model number fitted in with One2One's existing range which started with the m200 back in 1993. 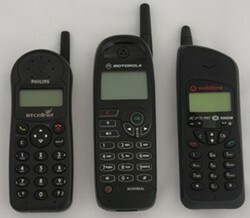 The Motorola Memphis was soon added as another option to this package. The Nortel m900 was a basic, but competent, well featured and well made phone. It was none too exciting, but far better than the phones the other networks offered on PAYG, when they followed Mercury's lead. Orange was quick to market a similar product. Orange justTalk handsets were the same price, but call charges were different. You only needed to top up every six months and top-ups cost £17.63, £29.38 or £58.75 for 15, 60 or 200 minutes respectively. If you went for the cheapest top-up you paid £1.18 per minute, possibly one of the dearest call charges in the history of mobile telephones. Orange only gave you one choice of phone, the MR201. The Motorola MR201 was a further stripped down version of Motorola's big, but ultra basic, digital phone, the d160. There was no facility to make international calls, unlike the Nortel m900. At only £99 for a basic handset, Vodafone's Pay as You Talk was the cheapest of the three new services and the only one to offer a choice of handset. Top-ups were cheaper as well, only £15, but you needed to buy one every thirty days. Calls cost either 40p per minute (any time) or 60p(peak)/5p(off-peak); you chose the tariff. Pay as You Talk was based on the analogue ETACS system and like Orange justTalk, it offered only bargain basement handsets. Customers could choose from three uninspiring options. For £99 you got the Nokia Ringo or the Motorola a130. The Motorola was the analogue version of Orange's PAYG phone and also devoid of much functionality. The Nokia Ringo was a cheap fashion phone aimed at the Nordic market. It was unknown in the UK and so basic it did not have a menu system; the Nokia RinGo had the distinction of being the UK's first PAYG Nokia handset. For £119 there was a touch of Italian style in the slightly more advanced, Telital PV129. The Telital brand was also unfamiliar to UK consumers. In 1999 the big supermarkets entered the mobile phone business and changed it forever. In August of that year a price war broke out between Tesco, Asda and Sainsbury. Tesco cut the price of its basic pre-paid offering to £49.99 and Asda drove the price still lower, to £39.99. Richard Hyman of Verdict, the retail analysts, claimed that choosing a mobile phone was a difficult and complex process and customers needed expert retail advisers to help them. He did not think that they would get that advice at Tesco. Thousands of shoppers, eager to get their hands on their first mobiles, disagreed. Tesco sold nearly quarter of a million phones and quickly became the third largest mobile phone outlet in the country. These phones were absolute basic handsets and you could have any colour you liked as long as it was black, but that did not matter. It was the difference between having a mobile phone and not having one. The Nokia 5146 was One2One's version of the fashionable Nokia 5110. In the early 2000s, some of the more fashionable Nokia phones were available on PAYG. It was Pay and Go that opened up mobile phone ownership to the masses. By the end of 2000 three-quarters of the population had a mobile phone.